We were cleaning the garage when this guy appeared out of nowhere. Again, feel free to frass any images that aren't useful. We take it this is the male? Quite the set of chompers on him! Yes this is the male with the large expanded antennae. Much more common to see the males than the females in my experience. Great photos! These things are not commonly seen. I think it's niger based on the lateral margin of the pronotum being more rounded (or at least that's what I think the three images show). Compare to and please read my comments under . 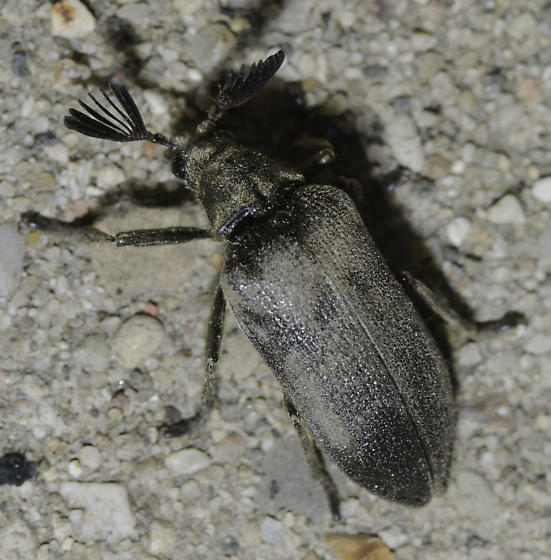 I have little data to back this up but based on the very few specimens of both that I've personally seen in the field (1 niger and 4 petrophya) I think that niger may have a more midwestern distribution and also flies later in the year as compared to petrophya. We added two closer crops of the pronotum and lightened them some so that maybe you can see the edge better. The straight thoracic shape is pretty diagnostic for S. niger. It's more pentagonal in S. petrophyta.